Sciblogs | What books do you think geeks should read? Wired has posted a list of nine books they think every geek should read. I’m left wondering what my readers would suggest are the books every geek should read. Those on Wired’s list are not all ones I’d have chosen. That’s not very surprising, of course – we all have different tastes. I certainly wouldn’t have included the first on my personal list of nine to recommend – Advanced Dungeons & Dragons Dungeon Master’s Guide. Nor the comic book series Watchmen. That’s not to say that I didn’t read comics as a kid – we used to trade them down at a corner book exchange a few blocks away from our house. I also played the text-only adventure games Zork, with their geeky puzzles. 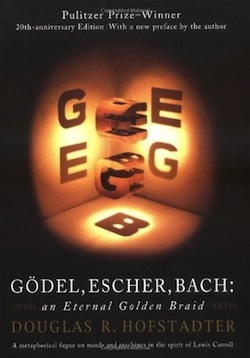 Books I have read on their list are Gödel, Escher, Bach: An Eternal Golden Braid, The Hitchhiker’s Guide to the Galaxy, The Lord of the Rings and The Visual Display of Quantitative Information. On the sci-fi front: Dune (Herbert), The Foundation series (Asimov). Rather than dredge up links to all of these, if you take a trip to GoodReads.com, enter the search field (confusingly located in a small box near the middle of the page, rather than at the top), you can find others’ opinions on just about any book. * But then I started with computers fairly early so I ought to be a computer geek too, right? Favouring thes science probably reflects that as much as I like messing about with computers and developing algorithms, in the end I like to use them as tools to explore scientific problems. I’d add adventurous travel too, but I guess that’s not very geeky. ** Then again they’d need to offer more than nine . I’d add Italian author Primo Levi’s ‘The Periodic Table’. And perhaps ‘Wonderful Life’ by Stephen Jay Gould, despite his squabbles with Richard Dawkins. It made a big impression on me at the time. I’m a big fan of a well-rounded scientific reading list ..
Read both; both excellent, too! Iâ€™m sure readers have a wider idea of whatâ€™s out there than I do. From memory Wonderful Life includes an outline of the punctuated equilibrium concept, which is good food for thought (whatever your find views on it). Me again – Oliver Sachs’ Uncle Tungsten. Fabulous. 2 all time Gem’s of writing and science by all-time gems of science. : lewis thomas’ : late night thoughts while listening to mahler’s ninth symphony; Buckminster fuller : comprehensivity. For SF, Kim Stanley Robinson : the Mars trilogy. Riyad – thanks for the suggestions – havenâ€™t heard of the first, must hunt around for reviews. Ah, yes, there is a tactical problem there. What did you think of Benfordâ€™s Martian books, e.g. The Martian Race – ? Benford is a scientist (I forget what branch of cosmology or astrology he works in), and it shows. I’m afraid I read Benford over a decade ago and can’t remember it well. Must find the book again (possibly filed in one of many cartons of books in the garage, lol). I re-acquainted myself with Robinson earlier this year, with Hartmanns’ A Traveller’s Guide To Mars by my side. The two complement each other well. Also, I’d recommend any of Iain M Banks’ Culture novels. Oh yeah: Hitchhikers Guide to the Galaxy!! Julian May’s The Saga of Pliocene Exile and The Galactic Milieu Series should be floating around. And edging off into fantasy, Raymond Fiests Magician is a superb book. I wholeheartedly agree with most of their picks though. Neuromancer, Enders game, Hitchhikers and Watchmen in particular. As Stuartg says, restricting yourself to nine books – tricky. I wasnâ€™t trying to imply they were for children (or children only). Incidentally, the description of them as â€œa comic book seriesâ€ wasnâ€™t actually mine, but that from Wired. I originally wrote â€˜graphic novelsâ€™ myself, but in the end elected to follow Wiredâ€™s lead. Agreed, the Julian May books you mention are great reads. Also Asimov’s Foundation series was one I really enjoyed – his writing can seem dry in places but the concepts – fantastic. Non-fiction wise, A Candle in the Dark by Carl Sagan is a great read, as is The Empathic Civilization by Jermey Rifkin and for educationalists – The Element by Ken Robinson is a delightful read. Any of Pratchett’s “Science of Discworld” books – plus as Grant says, many of the other Discworld books as well. (His take on evolution – and university academics! – in The Last Continent had me in stitches. My “books to read” is already quite long thanks to Ken and others. The last thing I need is a “books to investigate” list …. … although some of those mentioned above seem quite interesting.